Today’s townland of Inch is one of 12 Irish townlands with that name. 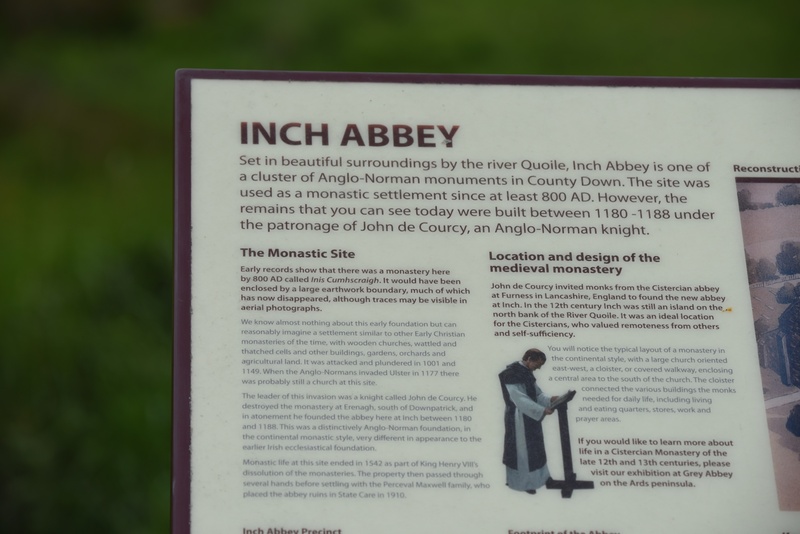 This one is near Downpatrick, in County Down, and is best-known for its Abbey. As the information panel says, the remains that we see today were built in the 1180s under the patronage of John de Courcy. 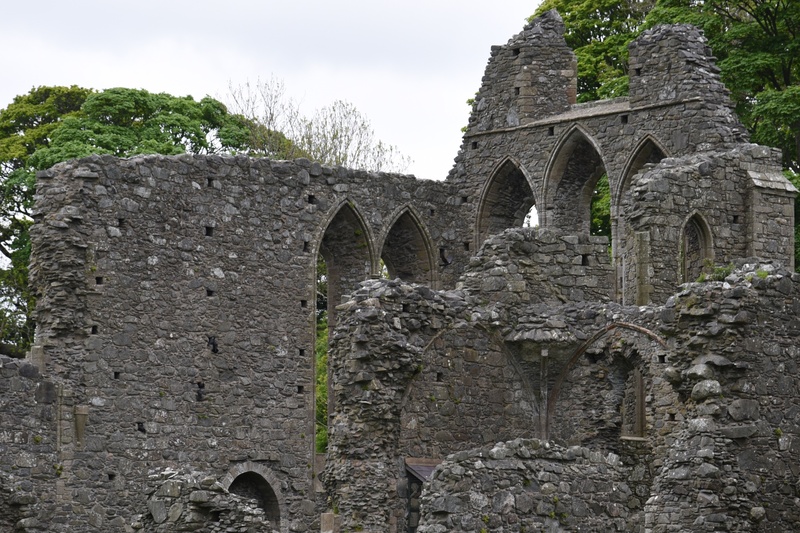 De Courcy keeps cropping up on this blog – he was responsible for forts in Ballymarter, Dundonald and Holywood. You can decide for yourself whether these visitors enhance the atmosphere of the abbey. 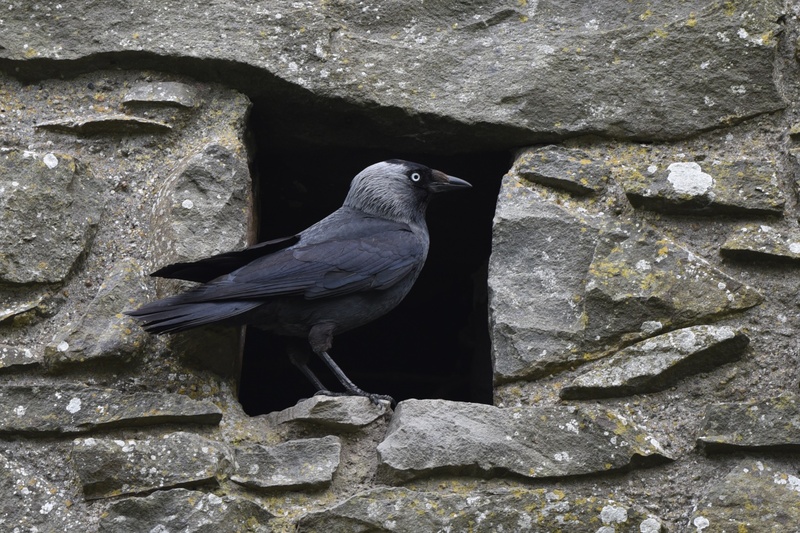 First, there was a jackdaw. 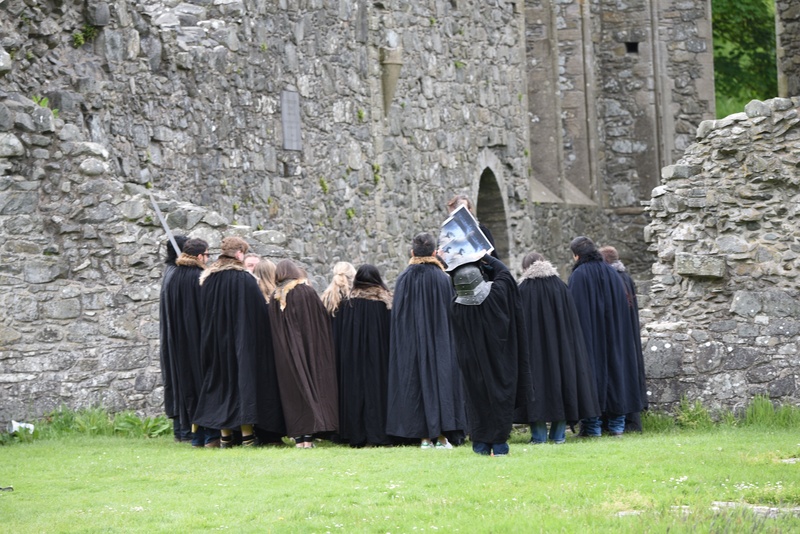 Then there was a group of costumed tourists on a tour of filming locations for HBO’s television series “Game of Thrones”. According to the website of PLACENAMESNI , the townland name comes from the Irish Inis Cúscraidh meaning “Cúscraidh’s island”. Inis Cúscraidh was shortened to Inis and then anglicised as Inch. As well as meaning “island”, inis can mean land partly surrounded by water, or liable to flood. So it appears in the names of many places that are not quite islands, like the Inishowen Peninsula in County Donegal, the town of Ballynahinch in County Down, today’s townland on a water-meadow of the Quoile River, and the townland of Magherahinch near Hillsborough, County Down. 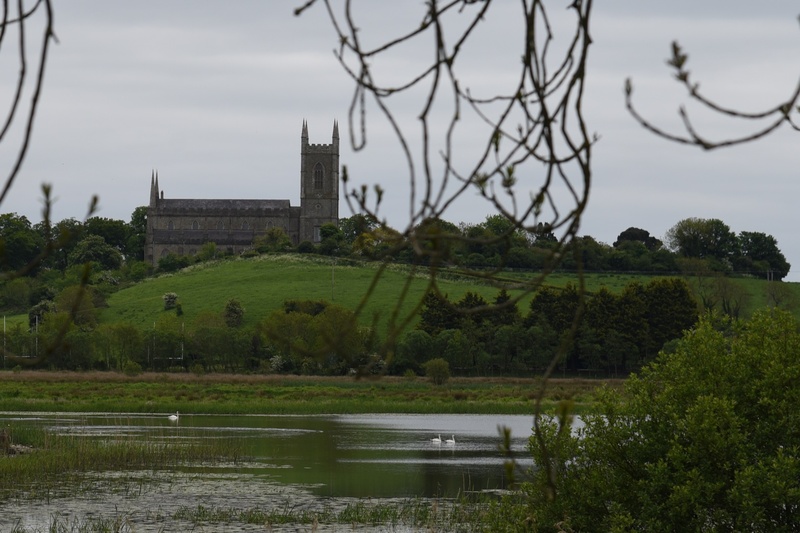 The next image is taken from Inch Abbey, looking across the Quoile towards Down Cathedral, in the townland of Demesne of Down. Who was Cúscraidh who gave this place its name? PLACENAMESNI has no definite answer, but does mention the King of Ulster’s son, Cúscraidh Mend Macha, who may have lived in Inch, if the Táin Bo Cuailnge ( “Cattle Raid of Cooley”) is to be believed. 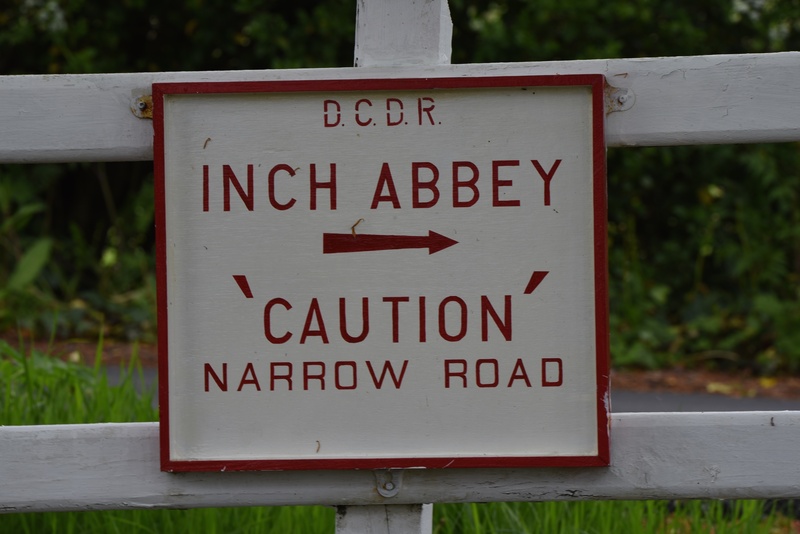 The road leading to the abbey is narrow as this sign suggests. But what does “D.C.D.R.” stand for? It’s the Downpatrick & County Down Railway. This is a volunteer-managed heritage railway, running a vintage trains between Downpatrick and Inch Abbey on holidays and summer weekends. 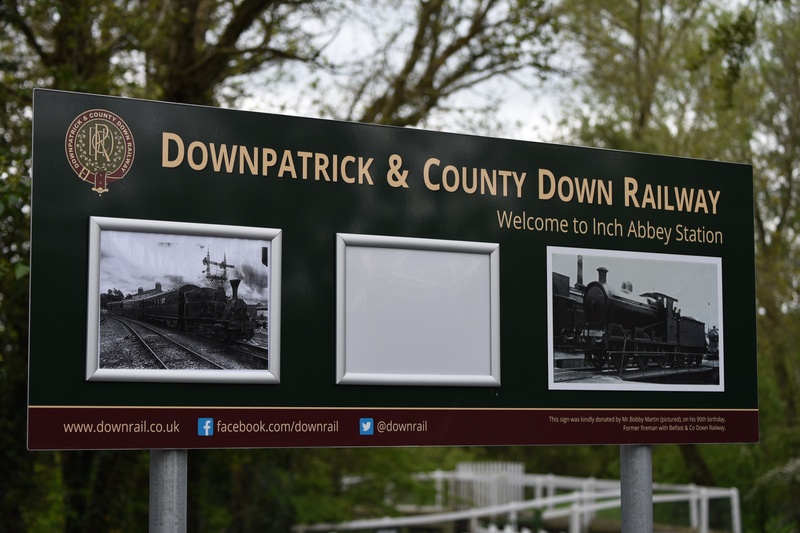 The DCDR was running on Friday, aiming to ease congestion on the streets of Downpatrick on St Patrick’s Day by encouraging people to travel into the town by train. The next trains run at Easter. Click here for the railway’s website. If you’ve followed this blog for a while, you’ll know that I am a fan of farm gates. At last, I find confirmation that other people consider them valuable too. 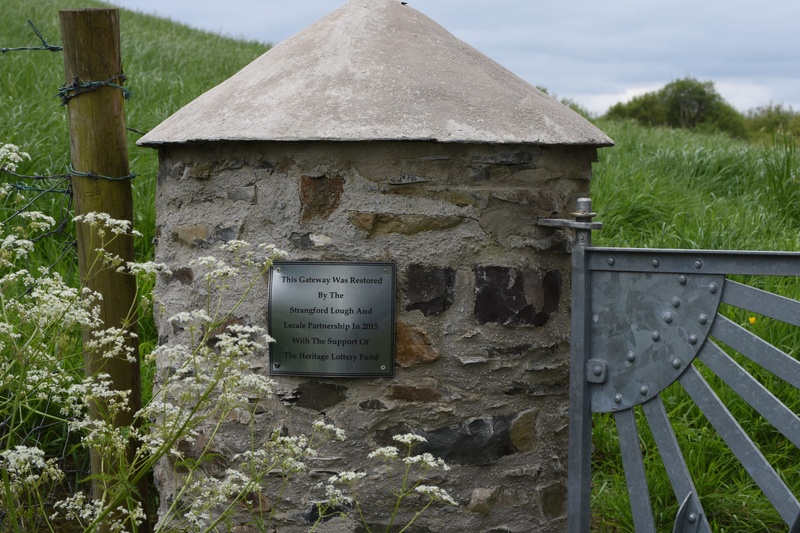 The sign on this pillar in Inch says that the gateway was restored in 2015 by the Strangford Lough and Lecale Partnership with the support of the Heritage Lottery Fund. Which county is Inch in? County Down. Which civil parish is the townland of Inch in? The parish of Inch. Which townlands border Inch? Ballyrenan to the north; Demesne of Down to the east; Hollymount to the south; and Annacloy and Woodgrange to the west. Click here to see a map of the townland on Townlands.IE. Click on this link to read more about the townland name on the website of PLACENAMESNI.ORG.